Inexpensive gifts can be made in homemade crafts. These gifts can be the best kind to give and receive. These unique bath/body products include: homemade soap, shampoo bar, lotion and lip balms. These products are handcrafted with fresh ingredients. They have NO parabens and damaging sulfates! These homemade crafts may be inexpensive, but they're not cheap! An assortment of goat milk soaps that are wrapped first with Alpaca wool, then with hand painted Merino wool. The Alpaca wool is felted directly on the bar. Alpaca wool has antibacterial properties! It shrinks along with the soap, and when the soap is gone, you still have a cool, little soft wool scrubbie. This is much more classy than a nylon scrubbie or loofah. They are totally natural, unbleached and un-dyed alpaca, decorated by a top layer of hand painted Merino Sheep's Wool. 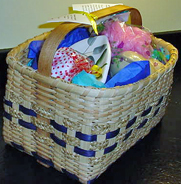 Homemade crafts can be placed in various containers: bags, boxes, cans, vases, bowls, buckets, etc.... It's really YOUR decision. Use any special container you'd like to use. Creative bath products are unique!